Sri Lanka is a tear shaped island just below India. For such a small island, the biodiversity the island offers is incredible. There can’t be many places of this size that offer beautiful beaches, cool highlands, diverse wildlife, colonial towns, chaotic cities, and ancient ruins. Then, there is the delicious food and ultra-friendly locals. If you are still deciding on a country to visit, why not consider Sri Lanka? Still need convincing? Below is what we think are the best places to visit in Sri Lanka in 2018. 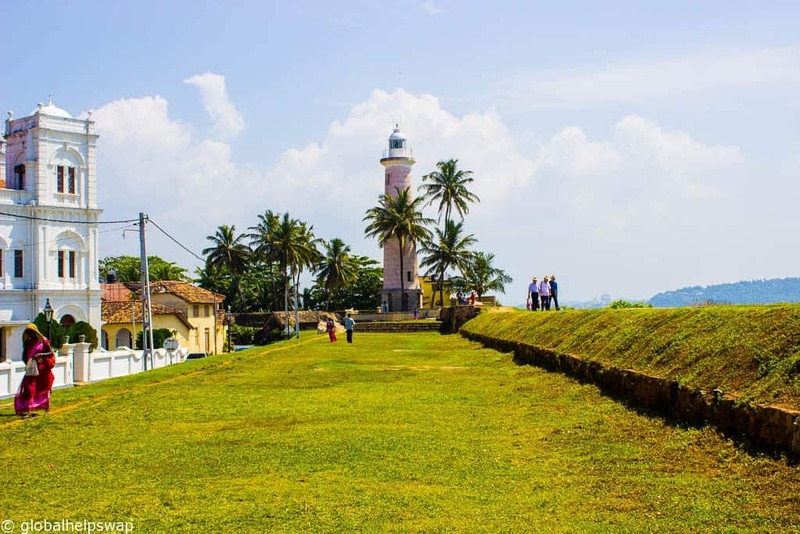 Galle is one of the unmissable destinations in Sri Lanka. The old town is jam-packed full of art shops, cafes, bars and boutiques all housed in beautiful Dutch colonial buildings. Galle is a magnet for writers, photographers, artists and poets and it’s not hard to see why. It’s a place where the heartbeat naturally starts to slow down and the rhythm of the day is at a mellow beat. Most of the sites are in the old town within the city walls. We would recommend just walking around and discovering the place for yourself. The architecture in Galle is beautiful and you can find some lovely cafes and boutiques. Make sure you head to the bastions to watch sunset. There is a great atmosphere there and it seems like the whole town has converged there to watch the sunset with you! And for good reason. When we watched sunset in Galle the whole sky turned red as it set over a field where kids were playing cricket. For more information on Galle read our posts on The perfect day in Galle and the best hotels in Galle. Out of all the beaches on the south coast, Mirissa was our favourite. It has a reputation as a party beach but during our stay we found no evidence of that. What we did find was a beautiful beach with calm warm waters and a mellow vibe. It’s a fantastic beach for swimming. Most people would spend all day on the beach (places offer free sunbeds if you order a drink from them), watch sunset, have a few drinks during happy hour and then eat the fresh fish that almost every restaurant displays right on the beach. There is nothing better than eating fresh seafood with your feet in the sand. 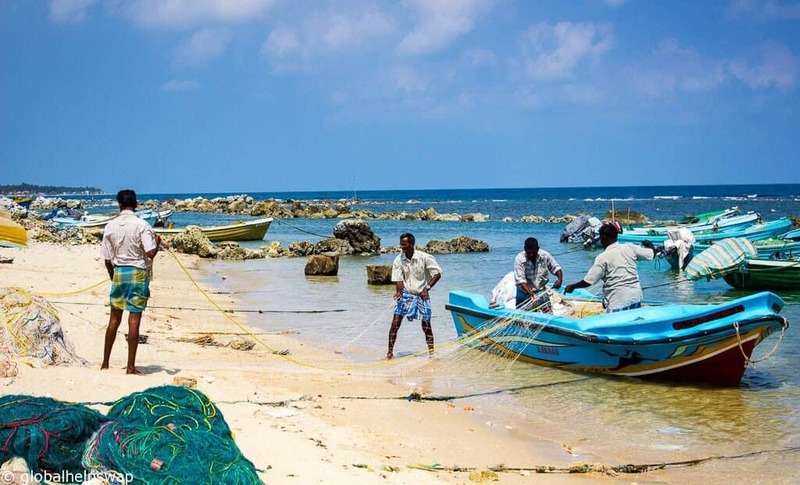 The accommodation is mainly across the road from the beach and is predominantly guesthouses which means your money is going directly to the locals. This is one of the best Sri Lanka beaches. For more details read our posts on things to do in Mirissa and the best hotels in Mirissa. Kandy is chaotic, dusty, noisy and jam-packed with traffic. Why am I recommending it, I hear you ask? Well Kandy is also very spiritual as it’s home to the temple of the sacred tooth and many monasteries. It is also surrounded by beautiful hills where you can go trekking and bird watching. 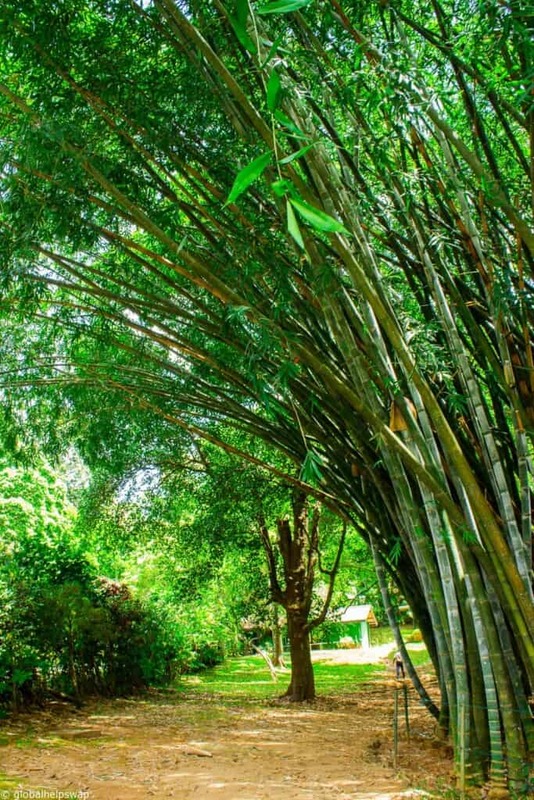 Make sure you take time out to visit the botanical gardens in Kandy. They are a calm, green oasis right in the heart of this bustling city. We loved these gardens and enjoyed having a little picnic under the shade of the trees. Oh Ella, oh Ella, how we loved you. Ella by far was my favourite place in Sri Lanka. The train journey alone was worth the visit. The train slowly passes through the hill country, giving you amazing views on either side. Make sure you book a 2nd class ticket on the train because you can open the windows in 2nd class to take great photos (in first class the windows don’t open). Sometimes you visit a place when it is at the perfect juncture. This was how Ella was for us. At the moment Ella has just the right amount (and type) of visitors. Ella has the best guesthouses in the country where you will find delicious home cooked meals and natural hospitality. 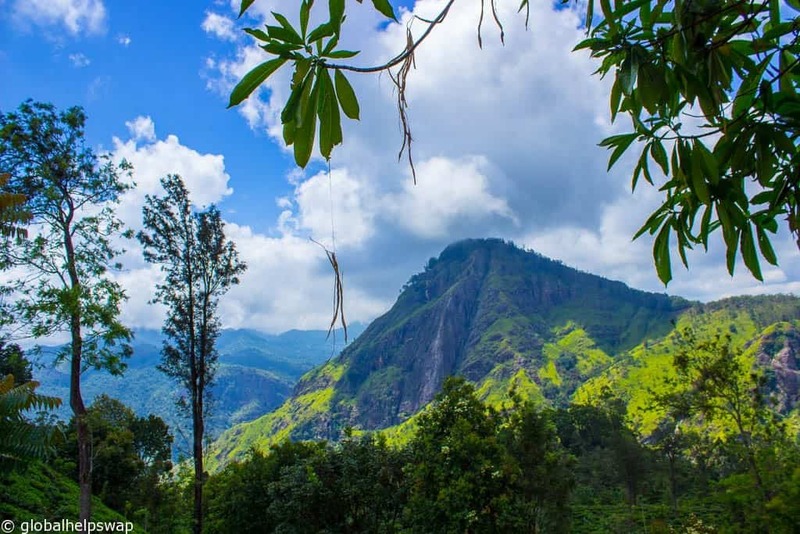 You come to Ella to relax but make sure you go on a few easy treks where you will come across waterfalls, tea plantations, temples and stunning views. Get to Ella before it changes. Ella is one of the best places to visit in Sri Lanka. For more details read our post on 8 top things to do in Ella. Nuwara Eliya is another stunning hill country town with the nickname little England. With its cooler climate, green hills, colonial hotels and large park, it’s not hard to see why it got that nickname. Nuwara Eliya became the favourite rest place for the early British pioneers of Sri Lanka’s tea industry because of its cooler climate. Even to this day, Sri Lankans like holidaying here as it does feel like you have left Sri Lanka. A highlight for us was cycling to and around Gregory lake. It was an easy cycle and once out the main town centre you start to see the mock colonial cottages dotted around the place which was quite a surreal sight. 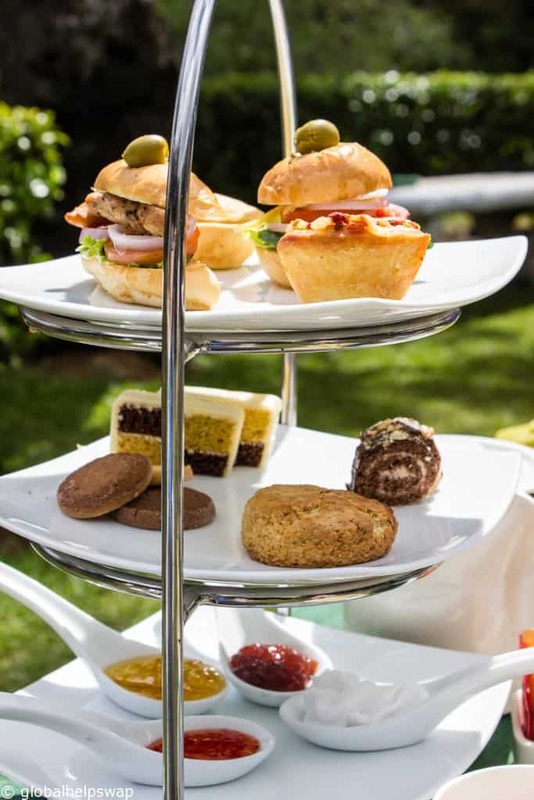 After an active morning we loved tucking into this gorgeous high tea served at Jetwing Saint Andrews. For more details read our post on Things to see in Nuwara Eliya. 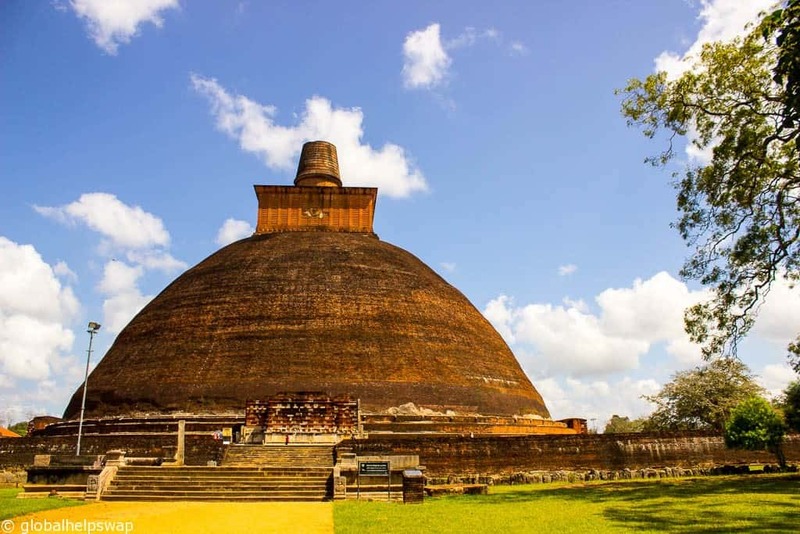 If you are interested in history and architecture, then Anuradhapura is the place for you. This sprawling site is full of ancient dagobas, crumbling towers, giant buddhas, ponds and lots more. Anuradhapura was the centre of rule over Sri Lanka for over a 1,000 years and is now a UNESCO world heritage site. It is worth spending a couple of days here as the site is so vast. We hired a tuk tuk driver to take us around and we were very happy we didn’t cycle as originally planned as the day soon got very hot and the distance to cover was huge. For more details read our post on things to see in Anuradhapura and 10 exceptional hotels in Anuradhapura. This choice is the most important one on our list. For nearly 3 decades Jaffna was inaccessible to travellers because of the Sri Lankan civil war. Slowly but surely, tourists are starting to venture to the far north to discover a city that has the scars of its past but is looking towards its future. Jaffna is the centre for Tamil and Hindu culture in Sri Lanka. 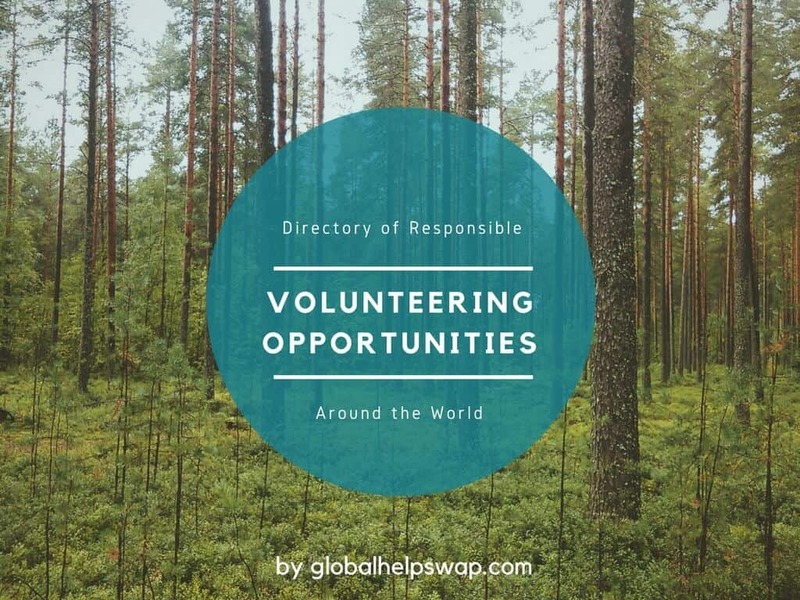 Here you will be greeted with warm smiles, inquisitive questions and general curiosity. Everything feels different in Jaffna, the food, the language, the religion. Not surprisingly for a place that has had 30 years of war, there is not lots to see in terms of sights. Visiting the temples is a must and the outlying islands just off Jaffna will be a tourist mecca in years to come but that is not the reason why you should visit. By coming to Jaffna you will help not only the people and business’, you will help kickstart a whole area. For more details read our post on Jaffna. Burmese Monks taking photos with their iphones and ipads! 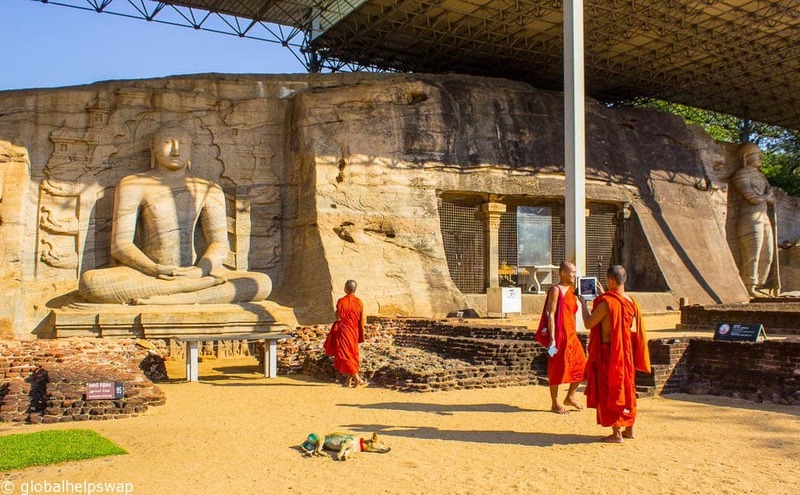 Like Anuradhapura, Polonnaruwa is an ancient site highlighting Sri Lanka’s past. We preferred Polonnaruwa as it had more variety. The park itself is easy to explore on foot, which makes you feel like Indiana Jones as you stumble upon ancient ruins that are totally deserted. Try to arrive early to avoid the crowds and the hot sun. This is THE site to see in Sri Lanka. 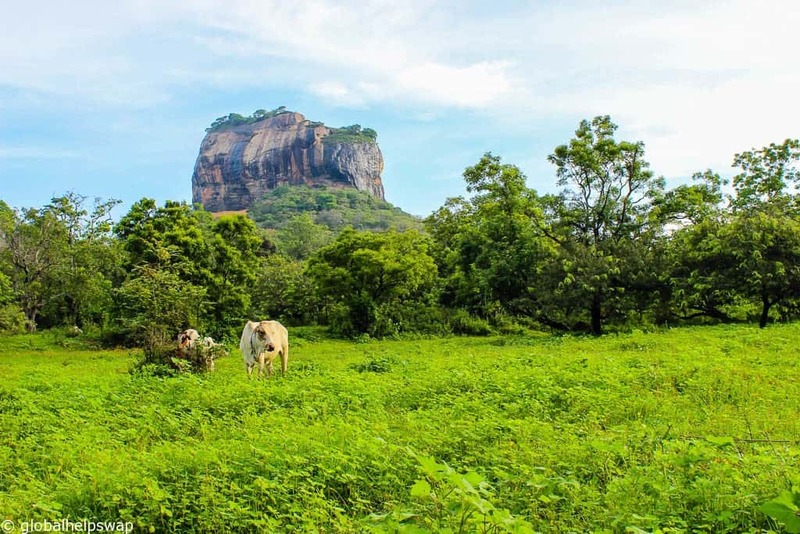 Sigiriya Rock is a rocky outcrop on the central plains with near vertical walls. Amazingly at the summit there are ruins of an ancient civilization that lived on top of the rock. Climbing Sigiriya Rock is no easy feat but the hard work and sweat is worth it. The views of the surrounding countryside is stunning. Sri Lanka is blessed with an abundance of wildlife. From roaming herds of elephants to numerous tropical birds. Throw in whales, monkeys and leopards and you have a nature lover’s paradise. There are numerous National Parks in Sri Lanka. We have visited 3; Yala to spot leopards, and Kadulla and Wasgamuwa to observe Elephants. For me this is where Sri Lanka excels. 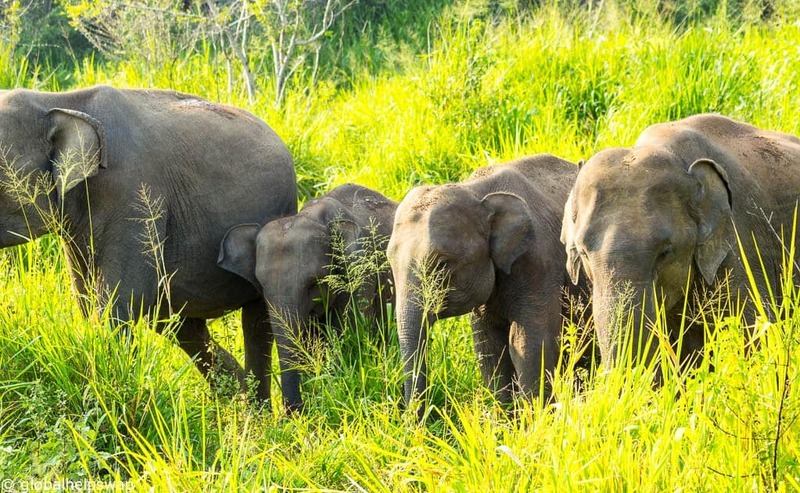 Sri Lanka is ideal for wildlife spotting. There are not many countries where you can go whale watching in the morning and Leopard spotting in the afternoon. If you are heading to Sri Lanka then find out what are our top 10 eco hotels in Sri Lanka are! We hope we’ve convinced you to visit this wonderful country. If you do go, as they say in Sinhalese “ārakṣita saṁcāraya” (have a safe trip). One of my friends travelled in Sri Lanka last year and was very enthusiastic. I would like to know if you would recommend us to travel here with children (ours are now 6,7,8). Maybe next year we would like to consider SL to visit. Looking forward to your respond, thanks in advance. Thank you for your comment. Sri Lanka is great for kids. The people are friendly, the ocean crystal clear and the wildlife superb so we say go for it! Let us know if you need anymore advice. Wow Great Post..!! I can’t wait visit to Sri Lanka it’s my favorite destination. i’m going to Sri Lanka with my best friend this year and I’ve been doing lots of research in preparations. Thanks for the comment. Have a great time! 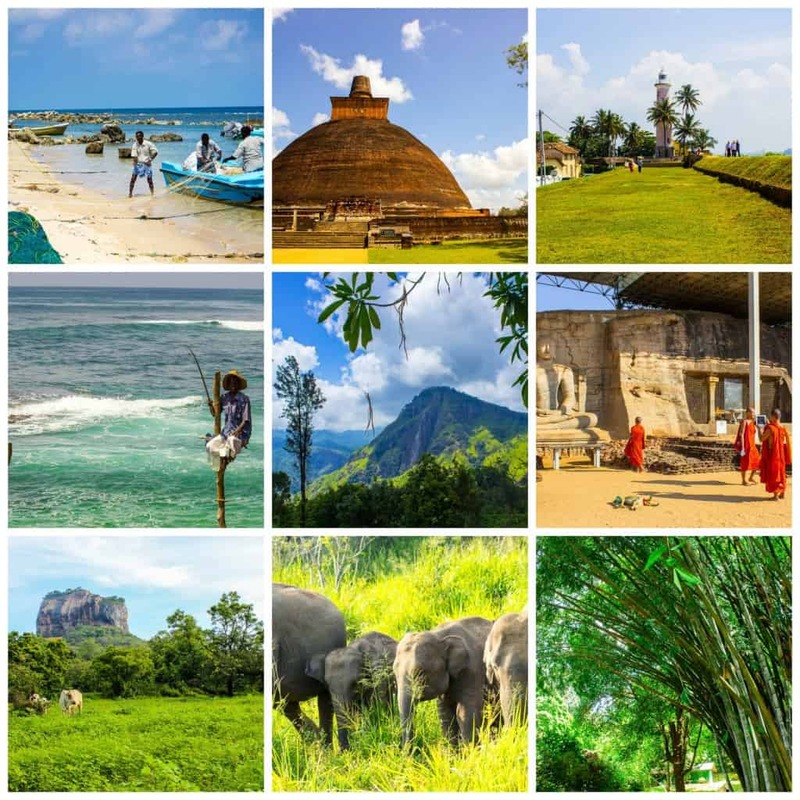 Our time in Sri Lanka is limited to 1 week, so we were planing on arriving in Colombo, spending a few days in Galle and then a couple in Yala national park. Is there anything you would suggest to do/miss out when time is limited? Thanks very much. Thanks for the comment. I would say those 3 places will be enough as there will be a lot of travel between each place. Have a great time! 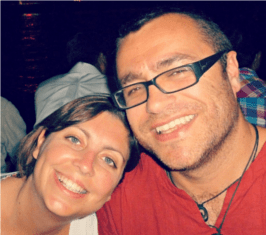 We are planning to visit Srilanka in Feb this year with 2 kids, Which is the best beach in Srilanka we should visit & what are the other places you would recommend for a total visit of 5-6 days. We would say Mirissa is our favourite beach. Have a great time! Hi Neil! 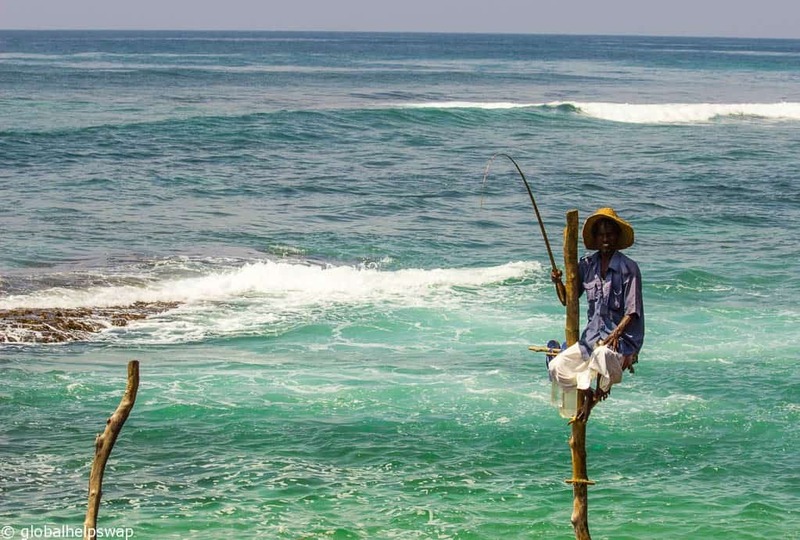 Mirissa and Galle are our favourite places in the South as well as Yala if you go that far. All 3 places have many guesthouse options. Have a great trip! In Colombo, leaving Wednesday on the journey. Would love to see Exotic birds. I read Sinharaja is great for that. What do you reccomend. Trying to visit Sgiriya and some hiking in rolling hills. Do you recommend Nuwara eliya or Kandy, or to just do that in Sgiryia? Trying to do 3 things from Wednesday to Sunday morning. Hi! Love your blog. I commented before but can’t find my post to reply to 🙂 anyway. I have Wednesday- Sunday afternoon. I want to do ancient ruins, hill country and see birds, I know Sinharaja is ideal for birds but so far from Sgriyia/Polonnarwa, amid Nuwara Eliya/Ella. And I read the train ride of Ella to Kandy is beautiful. What do you suggest for bird watching besides Sinharaja. And is a train ride from Sgiriya to Ella still beautiful? We are going through a travel agency, so I can also do private drive if train ride is not worth the time. So much to see! Thanks for your message. The train ride from Nuwara Eliya to Ella is one of the best in the world and highly recommended. We didn’t go bird watching, however you do get see lots of birds on your travels around Sri Lanka especially away from the big settlements. When are you going? Hi Paul! I’ve narrowed down what we are doing. I’m debating on using a travel agency to help us get to our attractions and to get to around the country from Colombo to Sgriyia to Ella. How did you all get around? We are going in July 2018. Cool. Well we were there for 3 months so had plenty of time to play around with. We mainly used trains and local buses. Wow! Amazing! Living life! Thanks. You are more than welcome Donna. An inspiring post! Looking forward to leave for this beautiful island!